Please click on one or more of the following tags to view a list of relevant links. A full set of 18th, 19th and 20th Century British Official Publications consists of approximately 250,000 Parliamentary Papers and an unknown number of non-parliamentary publications. 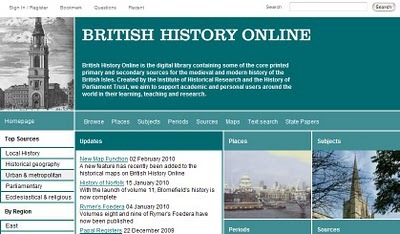 British History Online is the digital library containing some of the core printed primary and secondary sources for the medieval and modern history of the British Isles. Created by the Institute of Historical Research and the History of Parliament Trust. With 'Explore the British Library' you can search, view and order items from our main catalogue of nearly 57 million records, or search the contents of the Library's website. 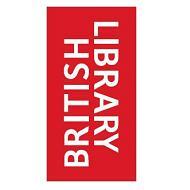 Search other BL catalogues for Archive and Manuscript sources. 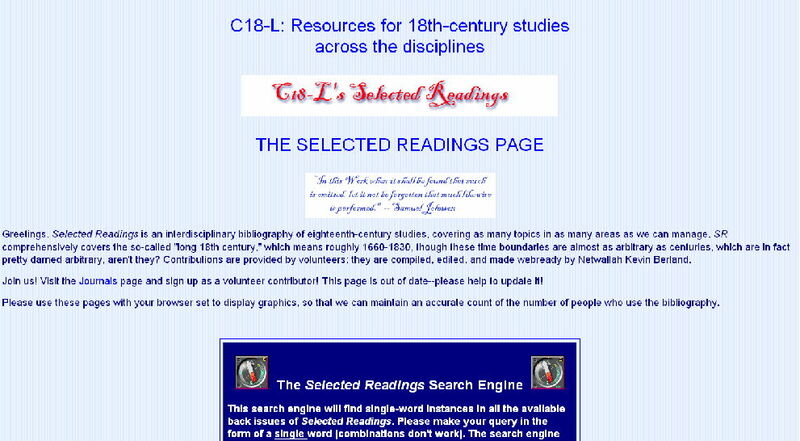 Resources for 18th-century studies across the disciplines, which has an interdisciplinary bibliography on as many aspects of 1660-1830 as possible. 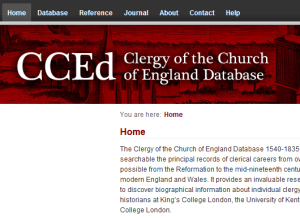 The Clergy of the Church of England Database 1540-1835 (CCEd), launched in 1999 and funded by the Arts and Humanities Research Council, makes available and searchable the principal records of clerical careers from over 50 archives in England and Wales with the aim of providing coverage of as many clerical lives as possible from the Reformation to the mid-nineteenth century. The Bodleian Library has unparalleled holdings of over 30,000 ballads in several major collections. The original printed materials range from the 16th- to the 20th-Century. The Broadside Ballads project makes the digitised copies of the sheets and ballads available to the research community. Quarterly online journal first published in 2000, is deliberately more informal than most scholarly journals with more emphasis on think-pieces and exchanges of scholarly opinions than on fresh scholarship. Copac gives you details of materials in over 70 institutions. This includes all the UK copyright libraries. 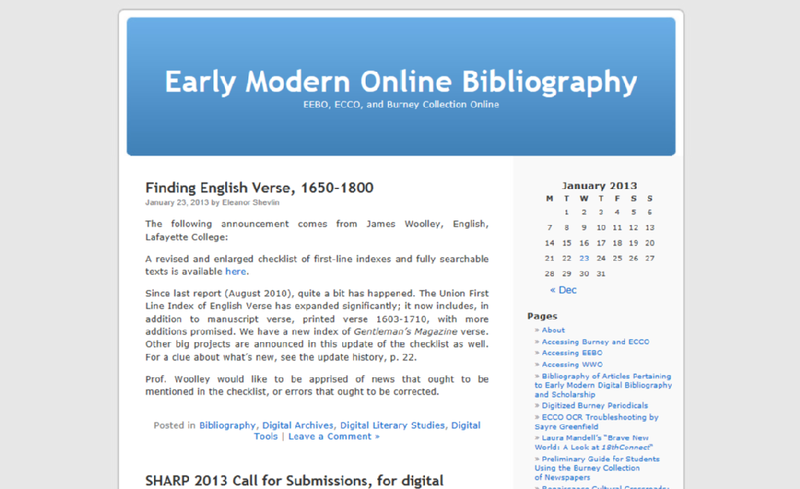 A huge online corpus of texts published in Britain from 1475 to 1700. Many include page images, and some transcriptions. 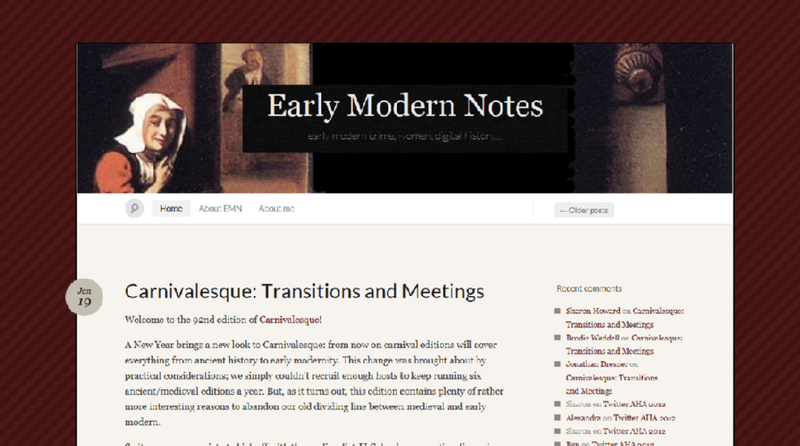 Early Modern Resources is a gateway site for anyone studying the early modern period (c.1500-1800 CE). It only lists resources that are free to access and are primarily concerned with the period. Sites are checked for suitability but not rigorously evaluated. This unique digital collection is maintained at Vanderbilt University and includes the oldest serial data on Africans in the Atlantic world, dating from the sixteenth century. Materials from the oldest churches in Havana and Matanzas are available online. An online corpus of texts published in Britain from 1700-1800, based on the English Short Title Catalogue and containing over 180,000 titles. 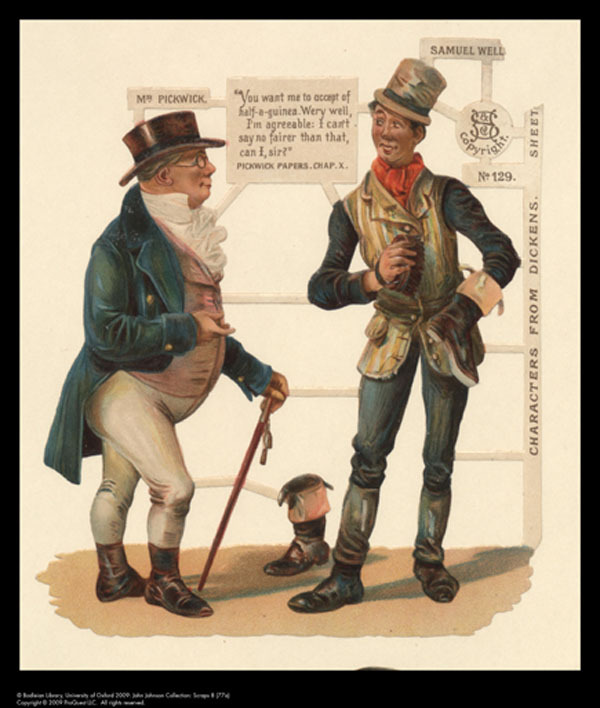 Empire Online is a powerful and interactive digital resource, enabling undergraduates, postgraduates, academics and researchers to explore colonial history, politics, culture and society. Books In Print offers one-stop access to more than 4 million titles — as well as 250,000 publishers. Integrating several leading databases within one Web interface. A comprehensive listing of theses with abstracts accepted for higher degrees by universities in the United Kingdom and Ireland since 1716. The Web of Knowledge Service for UK Education provides a single route of access to Thomson Reuters's products subscribed to by an individual institution. It includes Web of Science; Journal Citation Reports; Current Contents Connect; Derwent Innovations Index and many others. This platform provides a unique way of searching, including the ability to perform an 'All Database' search on the content of multiple searchable products. Iter, meaning a journey or a path in Latin, is a not-for-profit partnership dedicated to the advancement of learning in the study and teaching of the Middle Ages and Renaissance (400-1700) through the development and distribution of online resources. The John Johnson Collection of Printed Ephemera offers a fresh view of British history through primary, uninterpreted printed documents which, produced for short-term use, have survived by chance. Many of these images are available in print in Harriot (cited below under “Primary Texts: Letters and Narrative Accounts), but this website allows the viewer to compare and contrast watercolors with engravings. The Journal of Ecclesiastical History publishes material on all aspects of the history of the Christian Church. It deals with the Church both as an institution and in its relations with other religions and society at large. Each volume includes about twenty articles and roughly three hundred notices of recently published books relevant to the interests of the journal's readers. Since its inception in 1940, the Journal of the History of Ideas has served as a medium for the publication of research in intellectual history that is of common interest to scholars and students in a wide range of fields. JHI defines intellectual history expansively and ecumenically, including the histories of philosophy, of literature and the arts, of the natural and social sciences, of religion, and of political thought. 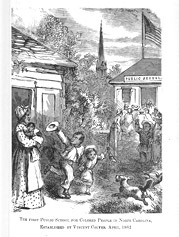 Library of Congress Hispanic and Portuguese Collections: An Illustrated Guide. The Hispanic and Portuguese Collections of the Library of Congress are the most extensive in the world and include more than ten million books, maps, periodicals, government serials, and newspapers. The collections include rare books, manuscripts and maps about Spanish and Portuguese expansion into the Atlantic, Native American cultures, and the colonial histories of Spain, Portugal, France, and England in what is now the Caribbean, the United States, and Latin America. Founded in 1952, Past & Present is widely acknowledged to be the liveliest and most stimulating historical journal in the English-speaking world. The journal offers: A wide variety of scholarly and original articles on historical, social and cultural change in all parts of the world; four issues a year, each containing around seven major articles plus occasional debates and review essays; challenging work by young historians as well as seminal articles by internationally regarded scholars; a range of articles that appeal to specialists and non-specialists, and communicate the results of the most recent historical research in a readable and lively form. Founded in 1996, Reformation is a leading English-language journal for the publication of original research in scholarship of the Reformation era. It is sponsored by The Tyndale Society . Members of the Society receive the journal as part of their annual membership benefits. Please contact the Society to join or for other enquiries. View 253 digitised Renaissance festival books (selected from over 2,000 in the British Library's collection) that describe the magnificent festivals and ceremonies that took place in Europe between 1475 and 1700 - marriages and funerals of royalty and nobility, coronations, stately entries into cities and other grand events. 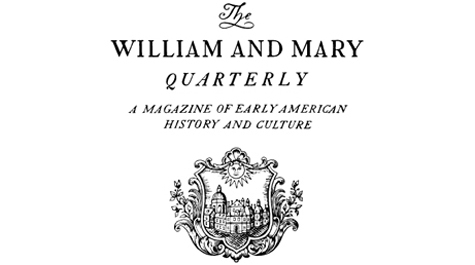 Renaissance Quarterly is the leading American journal of Renaissance studies, encouraging connections between different scholarly approaches to bring together material spanning the period from 1300 to 1650 in Western history. In publication since 1969, the Sixteenth Century Journal (SCJ) prints twenty to twenty-five articles and over four hundred book reviews a year. The SCJ is dedicated to providing readers with thought-provoking research and inquiry into the sixteenth century broadly defined (i.e., 1450-1648). Our articles all maintain a strong historical core and cover subjects from around the world. Published by the American Society for Eighteenth-Century Studies (ASECS), Studies in Eighteenth-Century Culture is an annual volume that features significantly revised versions of outstanding papers read at national and regional conferences of ASECS and its affiliates. Committed to representing ASECS's wide range of disciplinary interests, Studies in Eighteenth-Century Culture particularly selects essays that reflect new and highly promising directions of research in the field. The 1,280 images in this collection have been selected from a wide range of sources, most of them dating from the period of slavery. 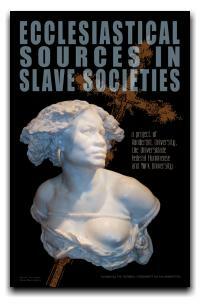 This collection is envisioned as a tool and a resource that can be used by teachers, researchers, students, and the general public - in brief, anyone interested in the experiences of Africans who were enslaved and transported to the Americas and the lives of their descendants in the slave societies of the New World. Since the mid-19th century, the Hakluyt Society has been translating and publishing sources detailing all aspects of the history of voyages of discovery and exploration. European encounters with Africans and Americans in the Atlantic world figure prominently in these volumes. Website includes a link to those older editions now available online. Easily accessible and searchable online edition of Jesuit letters detailing their experiences with Native Americans in North America during the sixteenth and seventeenth century. Contains some errors and should be checked against authoritative editions. The Seventeenth Century is established as the leading forum for interdisciplinary approaches to the period, and complements these with stimulating specialist studies on a wide range of subjects. The journal is international in its scope. There is a general preference for articles embodying original research. A searchable archive of the digitised Times Newspaper, covering the years 1785-2006. Now in its third series, it was transformed in the 1940s from a genealogically fixated Virginia journal to the premier journal in early American history and culture. Publishes the most important specialist articles on the American Revolution.